I nearly ate myself silly. Seriously. It was almost embarrassing -- yet not, because Corey and I have been married 15 years now, and he knows I love food. We got two appetizers, bread with really nice olive oil (two plates, thankyouverymuch), salad and an entree. And after all that, we decided to go for coffee. It was a cool, rainy afternoon (which could be any weekend in May; I have no love for this state right now), so we dashed under window awnings to a quirky, local coffee shop. 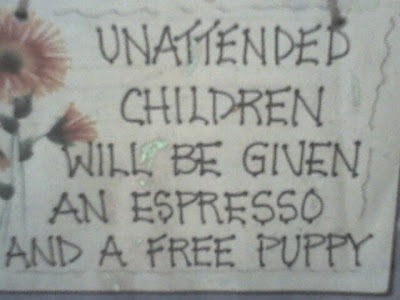 And there, on their barista counter, I discovered what is now one of my favorite business signs of all times. I'm laughing out loud AGAIN just posting it. Because if something is funny the first time for me, it is even funnier the second time. It's like humor squared. So tell me -- am I the last person in America to see that little gem? And/or do you have a favorite sign that you've seen out and about? Update: Right after I posted this, I left to get Natalie from school. On the drive home, I saw a bumper sticker that had the Marine Corps logo on it next to the words "When it absolutely, positively has to be DESTROYED overnight." Made me giggle. So let's include bumper stickers in this thread, too. Because there are some good ones out there. My husband and I recently discovered the joy of lunch dates, also. At that hour, we're not too tired to talk to each other. Husband and I love the lunch date option. Glad that you got to go. I haven't seen this particular sign but other versions of it. This one is particularly clever. The only thing they could add would be a chocolate muffin. With frosting. "my boss told me to change the sign so I did." I've seen it before and agree that it is hilarious! Ooo! Found a link to a pic! Cute sign! I'm looking forward to lunch dates again next fall when all my kids will be in school full day and I will no longer live life in 3 hour increments. Glad you could get away, and glad your time away included some laughter!! There is a store in my town that has a sign that reads "All Unattended Children Will Be Freeze-Dried and Shipped to Wisconsin". Very cute. I saw this sign on another blog a few weeks ago, but not in person. Love it! Too funny! Glad I happened upon your blog. The only one I may like better is a saying my friend has hanging on her fridge. It says, "Coffee, helping people do stupid things faster." I'm going to have to steal the lunch date idea. It's genius. Guess my brain cells aren't working that well either. Hey! I wonder if I've been to this coffeeshop? Does it have big windows in front with a dark bathroom? Shoot, if I could remember the name I'd give it. I can't remember, maybe off grand? I just know I've seen this recently! I saw a car with too many bumper stickers on the drive home tonight. My favorite? Probably- A village somewhere is missing an idiot, or something like that. Or- What if the Hokey Pokey really IS what it's all about? I just saw this for the first time last week! I laughed out loud, and then doubly when I saw your post. Jesus beat the hell out of death. The youth pastor put it up. The (conservative Mennonite) Board was not amused. It was taken down post-haste. SO funny! I had not seen that one yet! The only one I've seen lately that comes to mind is the one at Chili's that Amanda mentioned. The first time we saw that one was before my kids' critical thinking skills had caught up with their reading skills, and they were like, "REALLY???? Can they DO that???" Oh, I do have a refrigerator magnet that says, "No husband has ever been shot while doing the dishes." And my MIL has one that says: Sometimes I wake up grumpy. Other times, I let him sleep. I've never seen that one before! "We don't skinny dip here, we chunky dunk." Makes me feel right at home! On the deck at our favorite restaurant. . .not really a real "sign" but it's a placard on the wall: I hope I die peacefully in my sleep like my grandpa did. Not yelling and screaming like the passengers in his car. And I love Obey Gravity. It's the Law. I saw a bumper sticker today that said 0-60 in 15 minutes. Don't let worries kill you. Let the church help. I LOVE that one....I have not seen it before but it says it all! I saw that sign at a pumpkin farm and almost peed I laughed so hard. I used to date a guy who wore bowties to church. With seersucker suits (insert eye roll). It Really. Bothered me. I tried to be big about it and all, but it really. Bothered me. Bowties. Please. So recently I was driving the kids to school and I saw a truck with a horse trailer and, understandably, a lot of horse stickers, and then oddly, one that said "Bowties are for little boys" and I died laughing. I mean, how random is that? The woman 1) loved horses and 2) must have dated a guy who wore bowties. "Breast Enhancements! Buy 2, Get 1 Free!". I was shopping in store inside a quaint little town and while debating on what all to purchase, I noticed a sign that said, "Your husband called. He said to buy whatever you want!". So appropriate! I mean for me of course...not not so much my husband. My favorite is from a wall hanging my sister has in her house. I love it becuase I can relate... "Raising children is like being pecked to death by chickens". Ha - I love it.